In gratitude for bringing us all together, LARPBO Leadership Team has created the Tito Smith Memorial Fund. 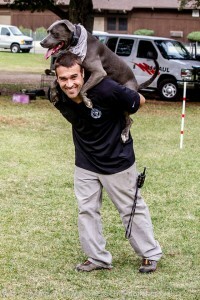 The funds will be used to continue Tito’s legacy of showing the world the potential of each dog. Funds will be used to pay for event registration fees where we can demonstrate the value of training and owner/pet relationship building and for select families who may not be able to afford our training classes. When you donate now, you’ll be making a better world for dogs and their people who love them. Won’t you help us today? All donations are 100% tax deductible. Click here to donate to the Tito Smith Memorial Fund. 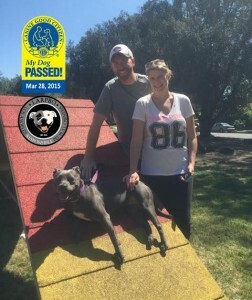 Los Angeles Responsible Pit Bull Owners. A 501c3 organization. Tito inspired a movement that has helped so many, especially my little girl. I was terribly nervous to have my reactive dog, Kyna, at a LARPBO class. I knew she needed work, but I was scared as to how she would act – would she go after a dog, snap at a dog, etc.? She had a bad experience with a different training group and I was scared. As we were driving around the park, I noticed this adorable little gray dog jumping on the back of some guy (Troy), catching things in the air, and just being cute as a bug… everyone had their eyes on him. Tito’s relaxed manner and attention to Troy made me feel confident that I was in good hands. I took a deep breath and took Kyna out of the car… we had a wonderful first class! 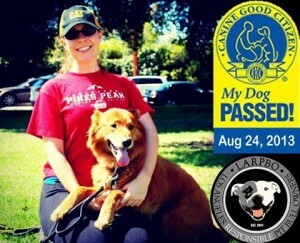 A few months later, Kyna was consistently cool as a cucumber at class and earned her CGC. With how nervous I was before that first class, I don’t know if I would have gotten out of the car without seeing Tito in action. 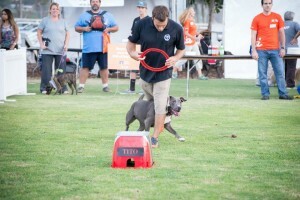 The happy look on Tito’s face as he ran around and showed off his skills tugged at my heart… I wanted my dog to be like that. Without seeing Tito playing before class, I probably would have driven past and skipped the class; I was that nervous to attend. Tito truly inspired and helped me and my dog begin our journey to having confident and happy connection. Tito, thank you! When Karen and I first adopted Brooklyn, we were afraid we made a huge mistake. What the adoption agency referred to as “personality” was actual severe leash and dog aggression, so much so that we had to work on the outside of class for almost a year before serious progress was made. Anyways, several months after adopting Brooklyn, we had to go out of town, so we boarded her with Troy and some of the other LARPO members, not knowing what to expect due to her issues. 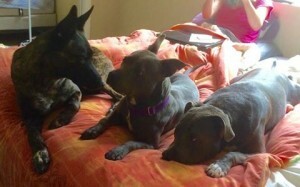 Receiving this photo of Brooklyn, Tito, and Kima helped relieve so much of our anxiety. Tito was a calming influence on our psychotic pittie, and he will be missed by all of us.